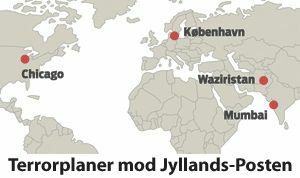 Danish police have arrested five men with alleged Islamic terrorist ties they say were planning an imminent shooting spree inside the newspaper offices of Jyllands Posten, the paper that published the 2005 cartoons that derided Muhammad. Four of the five men reside in Sweden. Danish media described the suspects arrested in Denmark as: a 44-year-old Tunisian national; a 29-year-old Lebanese-born Swedish national; a 30-year-old Swedish citizen of unknown ancestry; and a 26-year-old Iraqi seeking asylum in Denmark. A 37-year-old Swedish citizen of Tunisian origin was also arrested in Stockholm. Pakistan has indicted seven members of Lashkar-e-Taiba (LeT) for the 2008 Mumbai attacks.